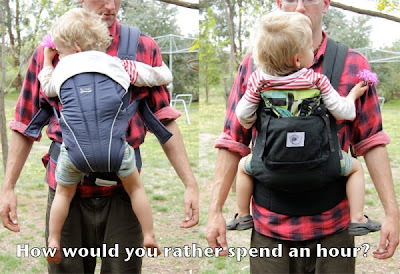 I have just read that the leading car seat manufacturer in Australia is bringing out a new baby carrier...and its a bloody crotch dangler!!! Are they serious!! How can they do this when they are suppose to be about children's safety! Those things are not safe! They damage babies/children's hips and spins. Not to mention how uncomfortable they are for the person wearing them. Shame on Safe N Sound for putting their money and resources into bring out such a horrible product. They should be putting their efforts into bring extended reward facing to Australia!! Would you like to be hung by your crotch for hours at a time? I think not. These pictures taken by one of the testers for this new carrier really says it all! !